AALBC.com is a massive web site; make sure you take advantage of all of our content by utilizing our site specific Google search engine. 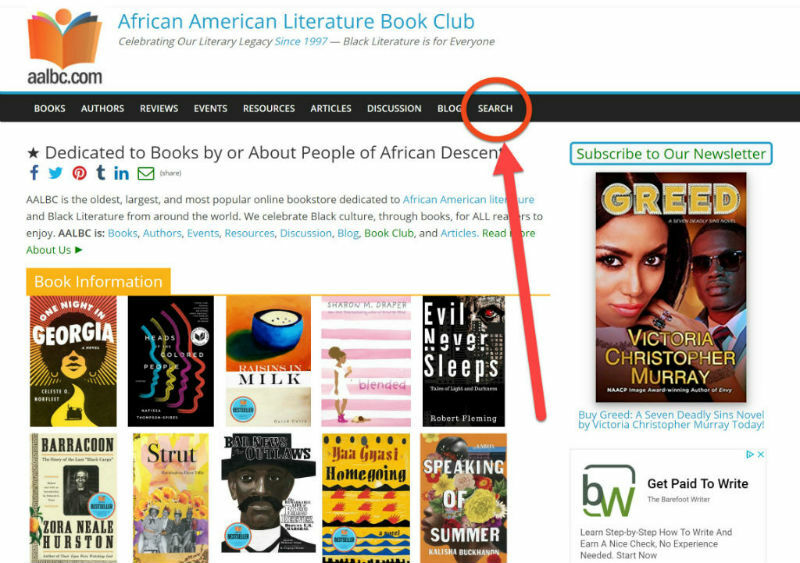 Our search box (shown by the arrow) can be found on every AALBC.com web page. If you are looking for information on a specific author, book, genre, or subject, simply enter the information into the search engine and you’ll likely discover a wealth of information. To find a book on a specific subject use our Search for Book by Category page. There you can find books in over 1,500 different categories. Hopefully, you’ll find what you are looking for here. If not, please feel free to email us or call: 347-MY-AALBC (347-692-2622), with any remaining questions you might have. Email communication is preferred. I know the word “Club” in our name implies some form of membership. 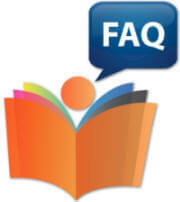 However, we don’t require membership — even to participate in our on-line book club. The only thing you should do is enjoy our content, let others know about us (use the social media icon at the top of the page) and share your ideas about books and Black culture on our popular discussion boards. The process simple. Please read our book review guidelines. How does AALBC.com Sell Books? Libraries: Virtually all of our books have links to check for availability at one’s local library. The goal is to get books into readers hands and we are happy to provide as many options as possible. If the author’s contact information is not provided, or is incorrect, please do not contact AALBC.com to request this information. You can often reach an author through their publisher or via the author’s official web site. I want to write a book what should I do? This is very broad question and there is really no simple answer that would apply to all individuals. While AALBC.com provides a host of resources for writers, at all stages of their careers, including manuscript editing, and consulting; our primary strength is helping authors promote their finished book to our on-line audience. That said, anyone who is interesting in writing a book should do two things: First, learn and continue to study the craft of writing. There are many courses and workshops you can take to help you do this. Second, aspiring authors should learn the publishing business. Whether you are looking for a deal from a publisher or interested in self-publishing your own work you will benefit a great by understanding the book business. Zane, an extremely popular author shared her insight on this very question on our discussion boards back in 2004: Click here to read what she had to say. I just finished my manuscript what should I do next? If you want it published through traditional means, you should find a good agent. If you want to publish your own book check out The Self-Publishing Manual by Dan Poynter. You may also find additional resources in our Writers Resources section. Can you recommend an Agent, Publicist, Editor, Ghost Writer, Printer, etc.? For editorial services please visit Edit 1st.com. Edit 1st provide a full suite of manuscript editing services. 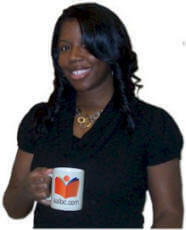 We also provide additional referrals for other professionals in our Writer’s Resources section. How do I get my book on AALBC.com? *Contribute an article or other form of content to the web site. If we publish it we will definitely mention your book. If we really like it, or you contribute regularly, we’ll create an author profile for you for free. Launch an AALBC.com ad campaign. Campaigns start for as little as $79 per month and can include placing your book, ad banner or video on virtually every single AALBC.com web page. We can even customize a campaign specifically for your needs. Visit our advertising section to learn more. *Tell us something that you have done which is noteworthy and we may mention you in our monthly eNewsletter. *Do something to support AALBC.com. Honestly it is MUCH easier to support someone who is mutually supportive. AALBC.com is also open to barter. Drop us an email and tell us about any ideas you might have. How do I learn more about AALBC.com? Please visit our About Us page. Can add a Link to AALBC.com on my website, blog or social media? Absolutely! Please, by all means, link out our site. Visit this page for some really cool banners you can use to link to our web site. What is the best way to contact someone at AALBC.com? Email: troy@aalbc.com (please be descriptive in your subject line), or call our ffice 347-692-2522 (347-69-AALBC). You can also reach me on our discussion forum (I read everything posted there). I emailed you but no one got back to me. Why not? Whatever the reason may be, if we have not responded to your email in 2 or 3 days, please resend the email or follow up with a phone call to (347-692-2522). Active clients customers should expect a reply within 24 hours. Can you tell me how to publish my book? Sorry we do not offer consulting in this area. While we provide a wealth of information for both writers and readers we are currently not staffed to provide individuals with detailed assistance on the steps required to get your book published. How do I get my book added to your club’s reading list? Can AALBC.com help me establish my web presence or increase my website’s traffic? Yes. AALBC.com’s founder and webmaster Troy Johnson provides One-On-One Internet Consulting to help individuals and small business create low cost websites (that they can maintain), increase traffic and take advantage of social media. The rate is $150 for the first hour and $75 per hour for each subsequent hour. Click here for more information. Can AALBC.com make my book available for sale? How do I learn more about AALBC.com’s founder and president Troy Johnson? Is Thumper really Troy Johnson? No. This was a very common question a during the early years of the website and is more like an obscure inside joke today. If your question was not answered above, please feel free to email or call: 347-MY-AALBC (email communication is preferred). Thanks again for visiting AALBC.com.